Around 33,000 lives a year could be saved if everyone in the UK followed dietary guidelines, research suggests. Eating five portions of fruit and veg a day has the biggest effect, say experts at Oxford University. Only a third of Britons consume enough fruit and veg, with the worst results in Scotland and Northern Ireland. The UK daily guidelines are to eat five portions of fruit and veg, no more than 6g of salt, and keep saturated fat to 10% of total energy intake. The research, published in the Journal of Epidemiology and Community Health, was based on a computer model linking food consumption with mortality from heart disease, stroke and cancer. Public health experts at the University of Oxford used it to analyse data for 2005 to 2007 from a variety of studies in the UK looking at links between diet and deaths. They used the model to predict how levels of heart disease, stroke and cancer would fall if everyone followed recommended dietary advice. Dr Peter Scarborough, from Oxford University, who led the research, said: "Meeting dietary recommendations would have a massive effect on the health of the nation. "According to our model, the biggest impact would be eating more fruit and veg. But this doesn't mean you should just stop at five - the more the better." Dr Scarborough said very few people in the UK achieved all of the dietary recommendations. But he said helping people to make simple choices about a healthy diet could have a major impact on disease. 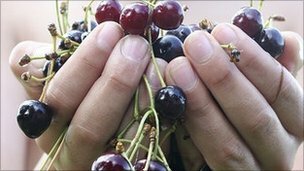 He told the BBC: "If we have a food environment that is better set up to encourage healthy eating we could have a big impact on health outcomes in the long term. "It's encouraging people to make healthier choices by making healthier choices easier." The study was co-funded by the British Heart Foundation. Senior dietician, Victoria Taylor, said: "This research highlights that well worn dietary messages - like eating five portions of fruit and veg a day - shouldn't be overlooked, because they could have a huge impact on our health." Her comments were echoed by Dr Rachel Thompson of the World Cancer Research Fund. She said: "This study highlights the important role fruits and vegetables play in cancer prevention and this is why we recommend people eat at least five portions a day of a variety of fruits and vegetables. "There is strong evidence they reduce risk of several types of cancer, including cancers of the oesophagus and the stomach. "Also, as well as directly reducing our cancer risk, eating plenty of fruits and vegetables can help us maintain a healthy weight. "This is important because we estimate that about 19,000 cancer cases in the UK are diagnosed every year that are linked to weight."